TOP MP40 AEG in Stock Now!! 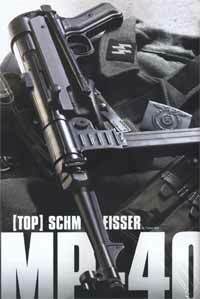 In the works for the past 2 years, TOP is finally releasing its AEG version of the famous WWII German SMG - the MP40. Created from stamped sheet metal just like the real steel version, the TOP MP40 is constructed almost entirely out of metal. The prototype we tested in January in Tokyo had a plastic fake wood lower receiver and a cocking lever that worked in pulling back the ejector port cover, which revealed the hop-up adjustment device (a very simple dial). The final version will have a simple matte grey/brown lower receiver. Most of the internal hardware is constructed from metal, including the nozzle and cylinder - which is a departure from the unique plastic type cylinder pumps found on TOP's other AEG models. Folding metal stock is quite heavy, and is actuated by a huge button on the rear of the receiver - as on the real version. Total weight of the MP40 is a hefty 3.4 Kg with a magazine capacity of 63 rounds. The gun is powered by a 9.6v battery (shaped like the AUG custom battery) stored in the receiver section just above the trigger. Buy one here while stocks last!